"Own up to the fact that you have a personal trainer, nutritionist, probable chef and a surgeon to achieve your aesthetic." 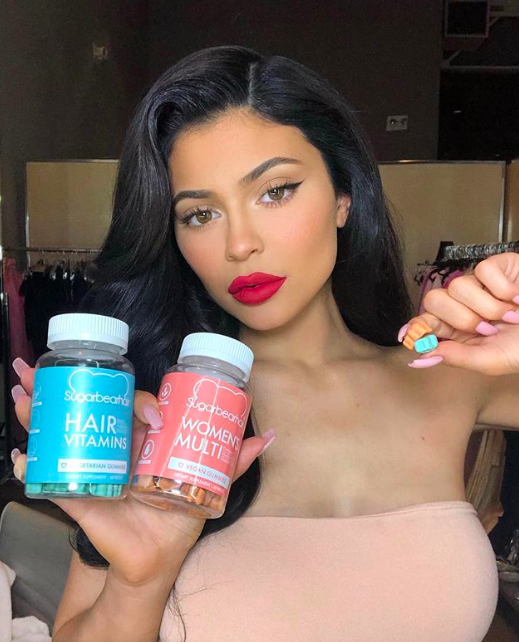 It's no secret that the Kardashian/Jenners rake in a huge amount of money for sponsored Instagram posts. In fact, it was reported last year that Kim Kardashian West can be paid up to $500,000 for a post, while Kylie Jenner commands $1 million per sponsored post. And it's also no secret that the family have been heavily criticised in the past for promoting diet products, including detox teas and appetite suppressant lollipops. She shared this photo of herself flashing her stomach alongside a caption claiming to have introduced the shakes into her routine two weeks ago, adding that the "progress" was "undeniable". However, fans weren't impressed, with many of them calling Khloé out for the post which they said encouraged "disordered eating". Others said the post was "damaging" and "irresponsible". Several said Khloé was wrong to promote the products now that she has a daughter. While some pointed out that the post was "inconsistent" with Khloé's Instagram stories, where she shares motivational quotes and positive affirmations each day. One of the people who stepped in to drag Khloé was Jameela Jamil, who's been incredibly vocal about body positivity over the past few months, and has also targeted the Kardashians specifically, labelling them "terrible and toxic influences on young women". In September last year, Jameela described Kim as an "agent for patriarchy", accusing her of having "body or facial dysmorphia", and said she was "pouring hatred" into the world. And then in January, Jameela branded Khloé "incredibly irresponsible" for posting a meme about weight loss on Instagram, telling young girls they should "want more" from their lives than a perfect body. So, when she saw Khloé's post, she decided to leave a comment. Jameela began by calling the post "irresponsible", and claimed that Khloé had likely achieved her body using a personal trainer, nutritionist, as well as a "probable chef and surgeon". She went on to list the side effects of the product which include "cramping, stomach pains, diarrhea and dehydration", and also pointed out that it wasn't FDA-approved. "It's incredibly awful that this industry bullied you until you became this fixated on your appearance," she continued. "That's the media's fault. But now please don’t put that back into the world, and hurt other girls, the way you have been hurt." Jameela concluded the post by saying: "You’re a smart woman. Be smarter than this." Some thanked her for "talking sense". And said it was the "best thing" they'd read on social media "in months". Here's Jameela's post in full. Representatives for both Jameela Jamil and Khloé Kardashian have been contacted for comment.